Bon Jovi is rescheduling two Montreal shows planned for Wednesday, April 4 and Thursday, April 5. The announcement was made via the band’s official Twitter account and concert promoter Evenko Wednesday morning. Tickets for tonight’s show will be honoured on Thursday, May 17 while the April 5 concert has been rescheduled to Friday, May 18. The New Jersey rockers are scheduled to perform in their home state this weekend in Newark. No word yet on whether the band has cancelled. 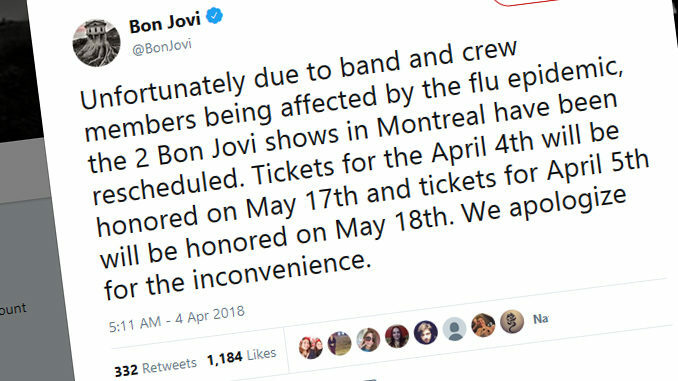 Unfortunately due to band and crew members being affected by the flu epidemic, the 2 Bon Jovi shows in Montreal have been rescheduled. Tickets for the April 4th will be honored on May 17th and tickets for April 5th will be honored on May 18th. We apologize for the inconvenience.